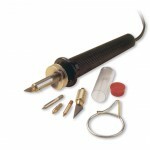 By popular request, I’ve made a small list of favorite tools I use for toy making, photography, and crafts. NON-TOXIC PAINT: To paint my kids toys I use Acrylic paints by A2 Chroma. They’re nice paints, non-toxic, and very affordable. CAMERA: I used to have a Nikon D70, but now I shoot with a Nikon D700. DSL cameras are big, but they’re totally worth it. For almost every photo on my blog I use a fixed 50mm lens. It has zero distortion, which is amazing for taking photos of people and photographing crafts. PRINTER PAPER: For Paper City, etc. I use a matte photo paper and a basic ink jet printer. The images are way clearer on the matte photo paper, as opposed to regular paper, and the matte is easier to photograph than glossy photo paper. If you’re just coloring for fun, then regular paper is plenty good. 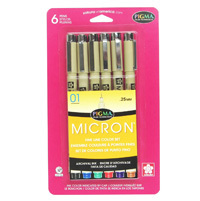 DRAWING PENS: For drawing coloring sheets and Paper Cities, I use Sakura Pigma Micron pens. They have a very consistent flow, and the ink does not bleed so the edges of your lines are very clean. Super nice! NON-TOXIC PAINT PENS: My favorite paint pens are Painters Opaque Paint Markers by Elmer’s. I use them on fabric, cardboard, and also to decorate wood toys. They’re non-toxic and have virtually no oder. (Except for the metallic colors, which do smell.) If you use them on fabric, then blow with a hot hair dryer to set the ink. It will then be permanent and even withstand washing. NON-TOXIC WOOD FINISH: The wood finish I use is a food grade beeswax polish by Three BEEautiful Bees. Just rub it on with your fingers. Great for your skin, and wooden toys! SAW: I use a scroll saw for almost all of my wooden toys. They’re great for cutting out small shapes. Also, they’re not very powerful, and they cut very slowly, so they’re great for beginners. I have a very old one. You can often find them used for very little money. I actually had one in my bedroom when I was 9 years old. What a nice mother I have! And she still has some of the toys I made with it! WOODBURNER: I’ve had a woodburner since I was 9 years old. It’s a nice non-toxic way to decorate wood toys. You can find them at most hardware, or craft stores. Just be careful, because they get very hot! 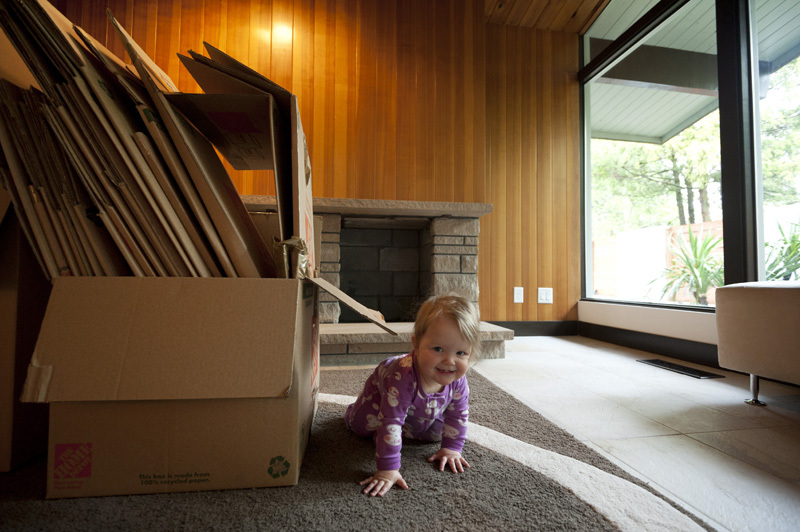 Moving with Kids – Any Tips? 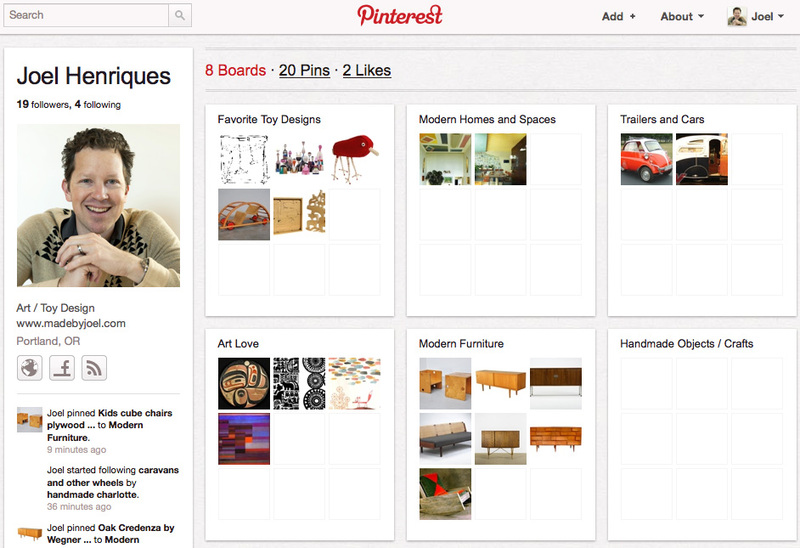 Come pin with me on Pinterest! New Page for Made to Play! 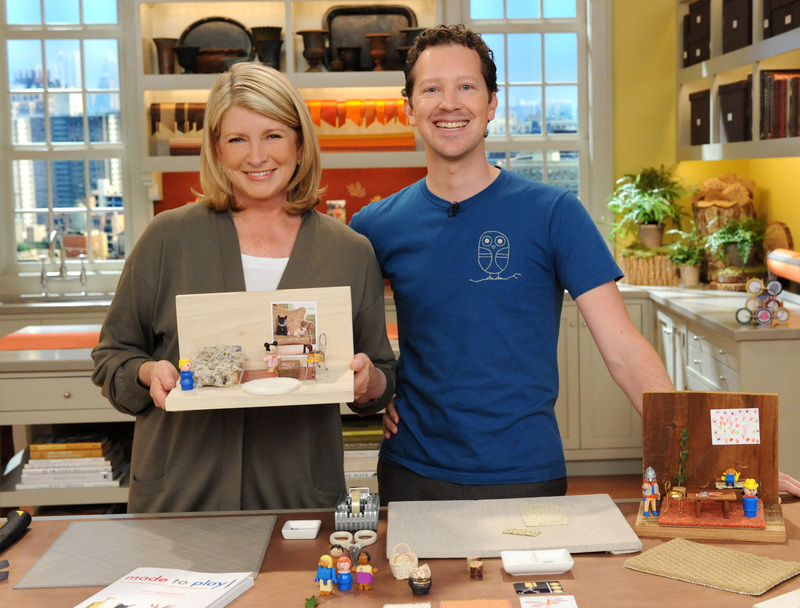 Martha Stewart Video – Making Dollhouses from Made to Play! Giveaway Winners and New Coloring Sheet! Thank you so much! I've been looking for good non-toxic paints for toys for ages! Gator - Yeah, it took me a long time to find some good non-toxic paints too. Milk paints are pretty good, but not nearly as bright or opaque. 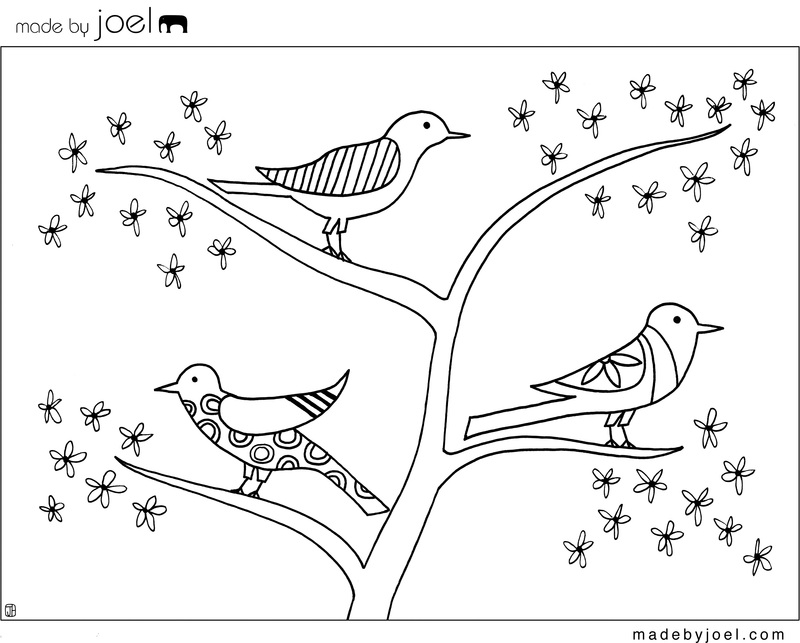 i love your blog joel. you're super inspiring. thank you for sharing it all. we use plain olive oil rubbed into wood which is also obviously non-toxic! I love the idea of paint in a pen. Makes it easier (for me) to create. Which do you prefer to use for the pen, fine or medium? Boo - I've never tried olive oil. Nice! Thanks for the link too. learning montessori - I have both fine and medium, but I use the mediums for almost everything. So unless you're wanting to do super detailed designs, try the medium size first. 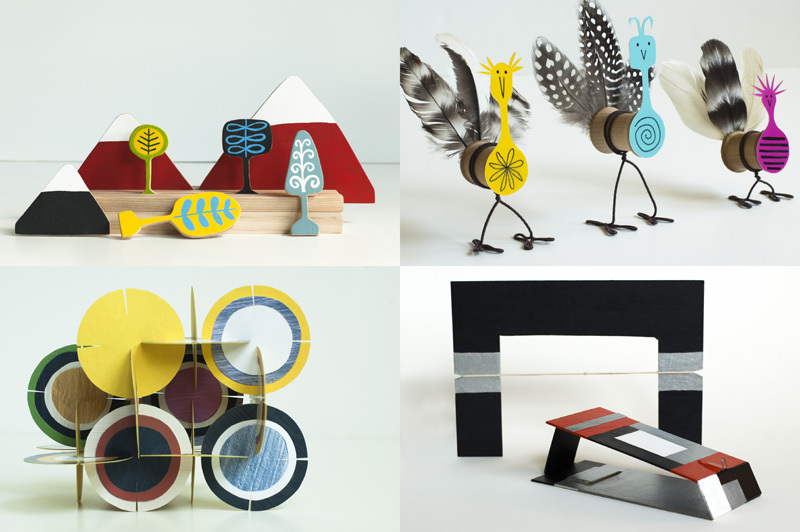 can i ask you what kind of wood you use to make your wooden slot animals, i see that they are some kind of plywood, i like the thinness and flexibilty of plywood but can't seem to find any non-toxic plywood here in Australia. 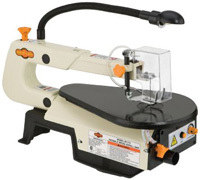 Can you recommend any good brand scroll saw? Are they easy to use? I have no experience in any kind of power hand tool. Thank you for sharing the tools list. Hello ! My name is maha and i live in lebanon. I just loooooooove your blog. I would say that one of your favorite tools is paper clip. I mean, you use it almost every time! I would like to know if the book is going to be sold only in the USA. i can't live without my exacto knife ..... we to a lot of paper crafting these days! Also clamps for gluing stuff ... clamps rock! I have to get a scroll saw one day ...... thanks for all the inspiration! emma - I use a bunch of different plywoods, but I'm still on the search for a good one. I'm not sure what type of glue is in the boards I'm using. I'll let you know when I find something really good. I'm actually looking for some next week for another project. Anonymous - I have a very old Delta. I'm not sure about the new ones, except that any of them would probably be a huge improvement over mine. You can't really go wrong. I would just go to your local hardware store and ask them what they suggest. Also, scroll saws are really quite safe, because they don't cut very fast, and the blades are so small. Probably the "friendliest" of electric saws. Maha - You're right! I've been loving paper clips lately. A couple of months ago I thought it would be fun to use them in a craft, and so many came in the box, I have to keep thinking of more things to do with them! Tanya - I hear you on the exacto knife! I love them. Also clamps are definitely handy. I should use them more often. When I was in art school my design teacher taught me a great exacto safety tip. Take a two inch long piece of masking tape, and tape it onto the end of the knife handle, leaving a "tape tail" so that it doesn't roll off the table when you set it down. 15 years later, I still have the same piece of tape on mine. ha. Do you know what the difference between a band saw and scroll saw is? Would one be better than the other to do small jobs like you do? Thanks for the recommendations! 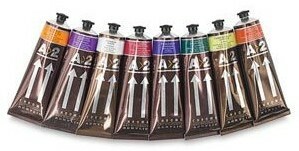 Yesterday, a friend asked me what kind of acrylic paint to buy, and I knew just what to tell her. My favorite toy-making tools are: a cordless driver drill, jewelers screwdrivers, paper, white glue, and Photoshop. I love to use old hardware and other re-purposed materials, and I use a large rimmed cookie sheet when I'm working on small or messy projects to keep things from rolling away or spilling on our dining room table. Sometimes I finish wood with food grade mineral oil. I crave a scroll saw and some beeswax! Maiz - Nice! Thanks for your material list! Very good ideas. I've used a band saw in college but never a scroll saw so I didn't know what the difference was. Sounds like a scroll saw is the way to go. Thank you for all the inspiration and great tips. I have just recently fallen in love with painting peg-dolls for my now twin 2 year old girls. Can you recommend some good paint brushes? Elle - I use old (but very nice) brushes that I inherited from my grandma. I would just go to your local art store and ask them what they recommend. Something fine and soft would probably be best. It's usually worth spending an extra couple of dollars to get the good one too. Have fun painting! J'aime beaucoup votre site et vos travaux !